On the edge of the Ebisu Garden Place is the coolest little café in my neighborhood. 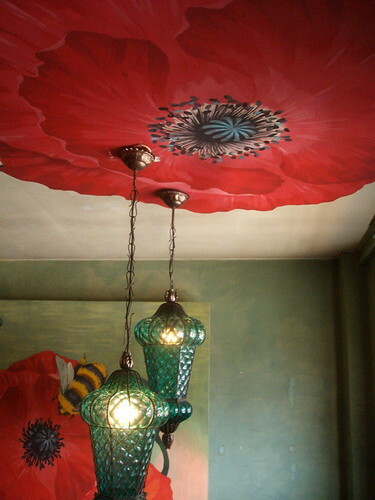 I walked past the Rue Favart for years and was always intrigued by the glimpse of the sumptuous poppies painted on the ceiling. I don’t know why I never went in. It was always on my way back home or to some place. I also liked that there were places I’ve never entered but would like to. What’s more delicious than an unopened present? Today T and I opened the present and it was indeed delicious. 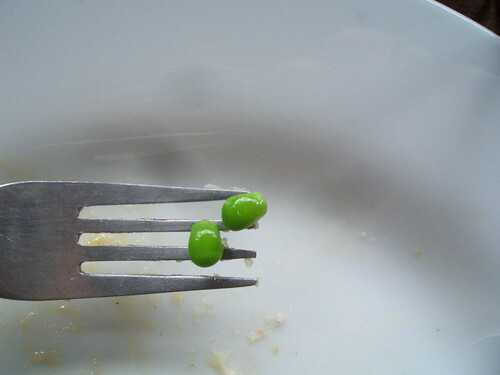 One of my favorite things about Japan is the lunch special. For about a 1,000 yen, almost all restaurants serve a choice of main dishes, and a drink. The lunch specials in Rue Favart, at 1260 yen is a little more than average, but it also includes a salad and dessert. I paid an extra 100 yen for wine. And it includes all you can eat fresh-baked foccacia. The food was quite good. The pumpkin custard was excellent. And the wine appeared to be a nice mellow Bordeaux. The theme of the café is rustic French, rural Italian. The second floor is casually charming with dark wood, ironic iconic art and weathered leather chairs. The 3rd floor, with plush blue chairs, had a brighter bistro feel. We got there early for the lunch special around 11:30 and got to sit anywhere. We picked the counter facing the window. It got pretty busy by 12:15. From 3 to 5pm there’s a light meal and dessert set. I imagine there are fewer people then if you want to do some reading or writing. There’s no elevator and the stairs are steep, so it’s not wheelchair-accessible, but I have seen tables on the first floor and outside on occasion. The clientele was mostly young office workers, nearly all women, with the usual pockets of housewives and madams that often take over cafes in the afternoons. Claimed by hipsters in the evenings. It’s a beautiful place to relax with an old friend who you’ve traveled with, and imagine yourselves stranded in a Provencal village, killing time before the next train arrives. Sketching summer flowers with watercolors. From Ebisu Station, take the East Exit and get on the walkway to the Ebisu Garden Place. At the end of the walkway go left along the street. At the end of the block you’ll see it diagonally across the street from the police substation. Thanks for testing! I did walk past it a few times but always thought I need to check it out and then just forgot it even existed! we just had dinner there tonight with some other people so we were able to try almost everything on the menu. even by tokyo’s high standards it was fantastic. and it had such a nice mellow intimate vibe, with good music, friendly service, comfortable chairs. awesome.